The Miami Dolphins were off to a 3-0 start as they traveled to Minneapolis to take on the Minnesota Vikings on September 25, 1994. Under the guidance of Head Coach Don Shula for the 25th year, the Dolphins had a potent passing attack directed by 33-year-old QB Dan Marino, who was coming off an Achilles tendon injury that had sidelined him for most of ’93. However, the ground game was a different story and while the defense was effective against the run, injuries in the defensive backfield made the Dolphins vulnerable. 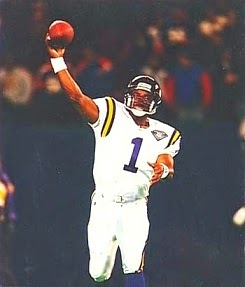 Minnesota, coached by Dennis Green, was 2-1 and also had a prolific veteran passer in QB Warren Moon (pictured above), who had been obtained from the Houston Oilers the previous offseason. Wide receivers Cris Carter and Jake Reed made for a good tandem and RB Terry Allen was back after missing all of ’93 due to a knee injury that required surgery. The tough defense had not given up more than 16 points in any of the first three games. There were 64,035 fans in attendance at the Metrodome. Both teams went three-and-out to start the game. The Vikings then put together an 84-yard drive in eight plays. 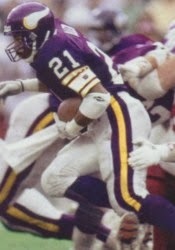 Terry Allen (pictured below) started it off with a 45-yard run to the Miami 39, and Warren Moon completed three passes, the last to Cris Carter for a two-yard touchdown. Fuad Reveiz added the extra point. Another short Miami series ended with a punt and this time Minnesota advanced 66 yards in 10 plays. Moon completed five passes, three of them to Jake Reed for 13, 17, and 15 yards, and Allen capped the series with an eight-yard run for a TD. Reveiz converted to stake the Vikings to a 14-0 lead that they carried into the second quarter. The Dolphins, who had been quiet on offense thus far, finally began to move the ball and Dan Marino threw to WR Irving Fryar for a 43-yard gain to the Minnesota 23. However, the drive bogged down at that point and the visitors came up empty when Pete Stoyanovich was wide to the left on a 40-yard field goal attempt. The Vikings punted but got the ball back when LB Jack Del Rio intercepted a Marino pass to give them possession at their own 47. Minnesota made the most of the turnover, going 53 yards in five plays. The biggest was a pass from Moon to Carter that covered 44 yards for a touchdown. Reveiz again added the extra point. Now down 21-0 midway through the second quarter, Marino filled the air with passes. A third-and-13 throw to WR Mike Williams picked up 15 yards and another third down toss was complete to Fryar for 17 yards to the Minnesota 45. But after getting down to the 28, the Dolphins again came up empty when Marino was picked off by DB Lamar McGriggs. Now it was Minnesota’s turn to go to the air, and Moon hit on five passes, the longest to RB David Palmer for 39 yards to the Miami eight and, from there, the last was to Carter for a TD. It was 28-0 with less than a minute remaining in the half, but the Dolphins responded by taking advantage of a short kickoff and going 49 yards in three plays. Marino finally got Miami on the board with a throw to WR O.J. McDuffie for a 26-yard touchdown. The try for a two-point conversion failed (and starting RB Terry Kirby suffered a season-ending injury on the play), and the Vikings took a 28-6 lead into halftime. The Dolphins had the first possession in the third quarter and Marino (pictured at right) completed six passes in an 11-play, 74-yard series that included a fourth-and-ten throw to Williams for 19 yards and concluded with a three-yard TD toss to TE Greg Baty. Marino then connected with Fryar for a two-point conversion that made the score 28-14. On Minnesota’s next possession, Moon completed a pass to WR Qadray Ismail for 34 yards, but the Vikings came up empty when Reveiz was short on a 52-yard field goal attempt. They got the ball back when Del Rio again intercepted a Marino pass at his own 27. This time the Vikings went three-and-out and had to punt, and the Dolphins weren’t stopped this time. Marino started off with a pass to Fryar for 19 yards to get into Minnesota territory and, facing third-and-14 after being sacked by DE James Harris, he connected with FB Keith Byars for six yards and converted the resulting fourth down with a 15-yard completion to Fryar. Two plays later, Marino hit TE Keith Jackson for a 25-yard touchdown and, with Stoyanovich booting the extra point, the Dolphins were down by only 28-21 heading into the final period. The Vikings reached midfield on their next series before having to punt, and Miami came surging back with a 76-yard drive in six plays. Marino had a 25-yard completion to Jackson, converted a third-and-ten play with a throw to Byars for the necessary 10 yards, and a pass interference penalty moved the ball to the Minnesota ten, from where RB Bernie Parmalee ran for a TD. Stoyanovich kicked the game-tying PAT to make the tally 28-28, capping a franchise-record rally. There were still over ten minutes remaining in regulation as the Vikings regained possession, and Moon moved them quickly down the field with throws to Reed for 13 and 21 yards. From the Miami 36, Allen ran 30 yards up the middle and, two plays later, RB Scottie Graham rushed for a three-yard touchdown. Reveiz converted and the home team was back in front by 35-28. Reveiz then squibbed the kickoff which was fumbled and LB Dave Garnett recovered for the Vikings at the Minnesota 49. With Graham running the ball, the Vikings reached the Miami 42 before a series of three penalties – the first on Miami, the last two on Minnesota – had them facing first-and-27 at the Miami 41. Moon threw two completions that covered 18 yards, Graham ran for three, and Reveiz kicked a 38-yard field goal to extend the lead to ten points. The Dolphins appeared anything but done when McDuffie returned the ensuing kickoff 46 yards to the Minnesota 49 with 3:37 to play. Marino passed to Byars for 11 yards and then Fryar for a big gain of 35 yards that, with an unsportsmanlike conduct penalty added on, placed the ball on the two yard line. Parmalee was held to no gain on a running play, and then it was three straight passes, the last falling incomplete on fourth down to give the ball back to the Vikings. A short series had Minnesota punting the ball back to the Dolphins, who started off at the 50 with the clock now down to 1:47. Once again Marino passed them down the field, and again it was a toss to Fryar that was good for a big gain of 31 yards to the Minnesota eight. This time Miami didn’t come up empty as Byars finished off the five-play, 50-yard drive with a one-yard scoring carry. Stoyanovich added the extra point to make it a three-point contest. However, there was only a little over a minute remaining and, when the onside kick attempt was recovered by Minnesota WR Chris Walsh, the Vikings finally clinched a 38-35 win. Miami, playing from behind for almost the entire game, led in total yards (473 to 458) and first downs (27 to 24). However, the Dolphins also turned the ball over four times, to none suffered by Minnesota, while the Vikings were penalized 10 times to just two flags thrown on Miami. Failing to come out on top after erasing the 28-point deficit cost the Dolphins a share of the NFL record for most points overcome to win a game. Warren Moon completed 26 of 37 passes for 326 yards and three touchdowns with no interceptions. Terry Allen ran for 113 yards and a TD on 15 carries. Jake Reed topped the Minnesota receivers with 9 catches for 127 yards and Cris Carter contributed 7 receptions for 81 yards and three scores. On defense, Jack Del Rio accounted for two interceptions. For the Dolphins, Dan Marino was successful on 29 of 54 throws for 431 yards and three TDs as well as three interceptions. 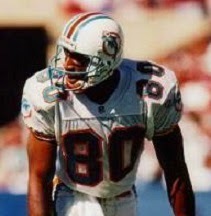 Keith Byars caught 10 of those passes for 79 yards and Irving Fryar (pictured below) gained 160 yards on 6 receptions. Bernie Parmalee topped the miniscule ground attack with 22 yards on six carries. Terry Kirby gained 13 yards on 9 attempts before being lost with torn knee ligaments. Minnesota lost the next week but then went on to win four straight on the way to topping the NFC Central with a 10-6 record. The Vikings lost to the division-rival Bears in the Wild Card playoff round. The Dolphins won the AFC East, also with a 10-6 tally, and reached the Divisional round of the postseason before being edged by San Diego. Warren Moon led the NFC in pass attempts (601), completions (371), and yards (4264), although his interceptions (19) outnumbered his touchdown passes (18). He was selected to the Pro Bowl for the seventh straight year. Dan Marino came in ahead of Moon with 615 attempts, 385 completions, and 4453 yards, which all ranked second in the NFL to New England’s Drew Bledsoe. 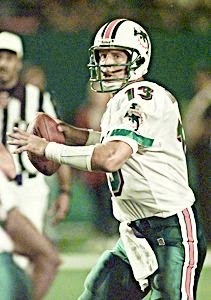 Marino led the AFC with 30 TD passes while giving up 17 interceptions. He received second-team All-NFL honors from the Associated Press as well as All-AFC and Pro Bowl recognition for the eighth time. Cris Carter set a short-lived NFL record by catching 122 passes (Detroit’s Herman Moore broke it the following year). He gained 1256 yards (10.3 avg. ), scored seven TDs, and was a consensus first-team All-NFL honoree as well as being chosen to the Pro Bowl for a second year in a row (of an eventual string of eight). Jake Reed ended up with a career-high 85 receptions for 1175 yards (13.8 avg.) and four scores. Terry Allen, successfully coming back from his severe injury, rushed for 1031 yards on 255 carries (4.0 avg.) and accumulated eight touchdowns. Irving Fryar gained Pro Bowl recognition for the second consecutive year by catching 73 passes for 1270 yards (17.4 avg.) and seven TDs. Keith Byars went down with an injury nine weeks into the season, having caught 49 passes for 418 yards (8.5 avg.) and five touchdowns.